The Largest Canyon In Our Solar System Is On? Sales Of What 20th Century Staple Have Been On The Rise For Twenty Years? Here on Earth, we have some pretty majestic geological formations including the appropriately named Grand Canyon, located in the American Southwest—a stunning example of a steep-sided canyon carved by the Colorado River. The Grand Canyon is 277 miles (446 kilometers) long, varies in width from 4 to 18 miles (6.4 to 29.0 kilometers) depending on the location, and attains a depth of 6,093 feet (1,857 meters) in some areas. As massive as the Grand Canyon is, however, it can’t hold a candle to the Valles Marineris, located on our planetary neighbor Mars. 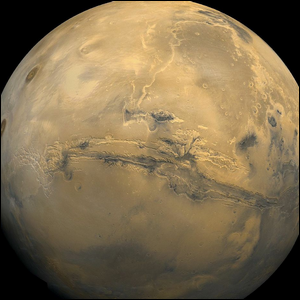 The Valles Marineris is so enormous it stretches for nearly one fourth of the way around the red planet with a length of over 2,500 miles (4,000 kilometers), a width of 124 miles (200 kilometers), and attains a depth of approximately 23,000 feet (7,000 meters) at some points. Although the canyon was historically believed to have been created by water movement on Mars, the most widely accepted theory today is that the Valles Marineris was created by rift faults much like the East African Rift here on earth.